The biblical story begins with God creating the heavens and the earth. 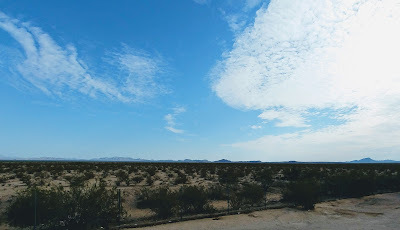 It is said that at that moment, while the earth was still a formless void and darkness still reigned, “a wind from God swept over the face of the waters.” The word translated as wind here in Genesis 1 can also be translated as Spirit. The connection of Spirit with water thus is rooted deeply in our story. But, it’s not just here that God is experienced in and through the waters. It seems as if there are regular crossings, whether Jacob is crossing the river to be reunited with Esau or the people of Israel crossing out of Egypt through the sea, or later entering the Land through the waters of the Jordan. Baptism becomes a key component in the Christian story, a means of entering the covenant community. Jesus receives his own endowment for ministry by entering the waters, and as a result receives the empowerment of the Spirit. 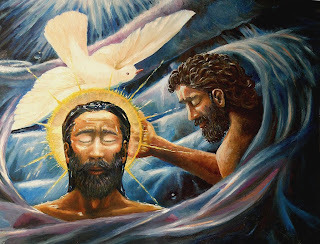 On this first Sunday after Epiphany it is traditional to remember the baptism of Jesus, to honor his coming out into ministry, a moment in which God recognizes Jesus as the one through whom God will reach out to the world – as John the Baptist declares – he’s the one who baptizes with fire and the Spirit. It’s not at the expense of water, necessarily, but John suggests that in Jesus God is taking us to the next step in the journey. And so we have three witnesses, one from Isaiah, and two Lukan witnesses – from Acts and from the Gospel. Water factors into all three stories, but so does the Spirit and even fire. Isaiah speaks out of the exile, offering a word of hope to Israel. The LORD speaks to the people, reminding them who is the Creator of the people, but also announcing that as Creator of the People, God is also the Redeemer of the People. In a word that has ramifications in the Gospel reading, YHWH declares: “I have called you by name; you are mine.” Keep this in mind as we hear God claim Jesus in Luke. But not only is Israel called by name, their redemption comes through the waters and fire. The People will pass through the waters and the fires, but will be preserved in the midst of these forces. Why? It’s because this People is “precious in my eyes.” This is a People that God loves, and therefore, they needn’t fear for their future. How often do we feel alone and isolated? What feeling does this create within us? Hostility or Hospitality? God says to the people – those “called by my name,” whom God created and formed for God’s glory, I will bring you home. In the Gospel of Luke, John the Baptist goes to the River of Jordan, and there he preaches a message of renewal and redemption. This redemption comes as the people respond to the call to repent and then pass through the waters of baptism. People wondered – is John the one? Is he the Messiah? Is he the one who will save the People on behalf of God? Our Advent journey reminded us that John’s calling was to prepare the way for another. In this First Sunday after Epiphany, we return to this point and follow it to the next step. The one whom John prepared a way has been revealed, or at least, will be revealed in a moment. John does respond to the questions. He does this by contrasting his ministry with that of the one to come. Whereas he baptizes with water, the one who is coming will baptize with the Holy Spirit and with Fire. The Spirit comes to empower, while the fire serves to refine. The wheat will be harvested, and the husks will be thrown into the fire. Yes, there is a word of judgment here, a warning that not all that is present in the world will be redeemed. This is a difficult word, especially when applied to Jesus, but there it is, and we must consider what it means for us. So John sets out the parameters, offering a vision of what will be. It is into the midst of this conversation that Jesus steps. Like everyone else, he comes to be baptized. In Luke’s version of this story there are no debates as to whether or not Jesus needs the water. John simply does as he is requested. It seems that despite the earlier revelation of a familial relationship (Luke 1:39ff), it would appear that John doesn’t seem to recognize the one who stands before him. In this passage there’s no reunion, no questioning of Jesus’ need for baptism, there’s just a baptism. Just like all other others, Jesus goes down into the water and receives baptism. But then, as Jesus comes forth from the waters, fully immersed and wet with this water, which signified repentance and cleansing, the heavens open and the Holy Spirit comes down upon him – in the form of a dove. We all recognize this image of the dove. We know it to be the signification of the Spirit. The coming of the Spirit, however, connects Jesus with John’s prophetic testimony that the one coming would baptize with the Holy Spirit and fire. Surely this is the one. And to make this clear, not only is there the visitation of the Spirit, but a voice from heaven making a claim on this person. As you hear the voice from heaven call out: “You are my Son, the Beloved,” remember the word from Isaiah – “I have called you by name. You are mine.” Jesus has no choice. God has put a mark on him. He has a calling, a purpose, he is God’s. Indeed, God says to him, just in case he didn’t yet know this, “You are my Son, whom I dearly love; in you I find happiness” (vs. 22 CEB). A Father’s voice, the Son’s obedience, the Spirit’s endowment. We can if we wish read into this an expression of the Trinity - - but of course do so cautiously. So here is the question? For those who embrace the call of Jesus and are baptized? Does God make the same claim upon them? And what comes with this water? Redemption? The Spirit? Refining judgment? Does God call me as God’s child and does God love me, even as God pronounced love of Jesus? At some point in time, perhaps weeks, months, or even years after Pentecost the church was scattered. It begins with the martyrdom of Stephen, but as a result the gospel moves out from Jerusalem, bringing good news of Jesus to new people and new groups. Boundaries are crossed and the church takes on a broader sense of itself. One of these evangelists was Philip, one of the seven – like Stephen. Luke tells us that Philip lands in Samaria, to the north of Jerusalem. It’s a land that for many Jews was “God-forsaken.” There was a strong and passionate dislike that existed between Jew and Samaritan. In other words, there’s a barrier to the gospel. Still, remember that in Acts 1:8 Jesus commissions the church to take the gospel beyond Jerusalem not only to Judea, but also to Samaria. And in this passage we see this come to fruition. When we come to the text for the week, Philip has preached the gospel, seen conversions take place, and he has baptized the people in the name of Jesus. But, it appears something is missing. They have yet to receive the Holy Spirit. They’ve experienced the water, but not the empowering presence of the Spirit. We’re told that when the Apostles in Jerusalem heard this, they sent Peter and John to Samaria to check things out. When they arrived they lay hands on these new believers, praying that they would receive the Spirit. And such did occur – according to Luke. This passage has always courted interest because it seems to separate baptism from Spirit. Seeking patterns, as we’re apt to do, some have suggested that the issue was the authorization. Philip could baptize, but not impart the Spirit. He was a Deacon, but the Spirit was imparted by a higher authority – an Apostle (or the apostolic successor). Thus, the origins of the Rite of Confirmation are detailed. Other interpreters see in this a separation between salvation (symbolized by water baptism) and the endowment of the Spirit (a second blessing). Because Luke suggests that something out of the ordinary occurred at the time of this action (remember the story of Simon Magus? ), some have suggested that the recipients of the Spirit gave supernatural evidence of this endowment – perhaps by speaking in tongues. But there’s another possibility. Perhaps the delay is a means by which the outsider is embraced and brought within the circle. In other words, this is a boundary crossing event, and by going to Samaria and laying hands on these people, Peter and John acknowledge the healing of a breach. Where there was once division, now there is the bond of spiritual affection. The inclusion of the Samaritans, through the intervention of the Spirit, paves the way for the Gospel to spread to the Gentile world, taking Jesus’ commission to its logical conclusion. With water, fire, and the Spirit the old passes away and the new realm, the realm of God, emerges and expands, bringing God’s love and peace to the world. We are invited to participate in this realm by receiving baptism and the endowment of the Spirit's power -- and from there cross the boundaries that separate us one from another.